Sumiko Hosaka (保坂純子, b. 1930) has worked as a puppet artist since 1953. Throughout her career she has made puppets for live theatre, TV, and commercials, but is perhaps best known for the puppets she made for the stop motion animation of Tadanari Okamoto. 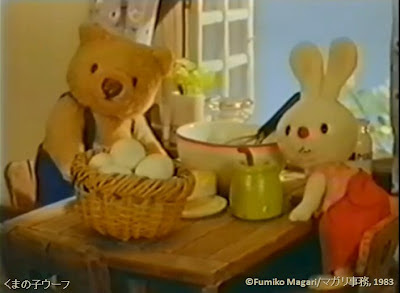 She has also made puppets for the films of Fumiko Magari and the Noburo Ofuji Award winning team N&G Production. Her first experience making puppets for stop motion animaton came in the early 60s when she was part of the original staff at Tadahito Mochinaga’s MOM Productions. She was on one of the puppet-making teams that worked on MOM Pro's first project for Rankin/Bass The New Adventures of Pinocchio (1960-61). Starting in the late 1960s, she began working for Okamoto, her former colleague at MOM Pro, after he had set up his own independent studio Echo Productions. She made puppets for many of his most significant stop motion works from The Mochi Mochi Tree (1972) to The Magic Ballad (1982). She also occasionally worked for Kihachirō Kawamoto – including his greatest work Book of the Dead (2005). Sumiko Hosaka currently teaches puppet making techniques at Laputa Art Animation School. Examples of her freelance work can be seen in her profile at Puppet House. Hosaka’s picks for the Laputa 150 poll in 2003 speak for themselves: a cross-section of some the greatest films in world animation. Reflecting her interest in puppets, the list is heavy with examples of stop motion animation by Jiri Trnka, Karel Zeman, Roman Kachanov, Jan Svankmajer, and, of course, Okamoto and Kawamoto. At #1, Hosaka placed the Soyuzmultfilm classic The Little Grey Neck (1948). In Japan, it was released on DVD together with Ivan Ivanov-Vano’s The Humpbacked Horse (1947/75) as part of The Ghibli Museum Library. It is also available to buy as a download here.